A non-alcoholic cocktail with Blue Curaçao? My hope of having a particular dish I've been longing for at Spectra Café & Restaurant was dashed when I got to know that it has closed down. 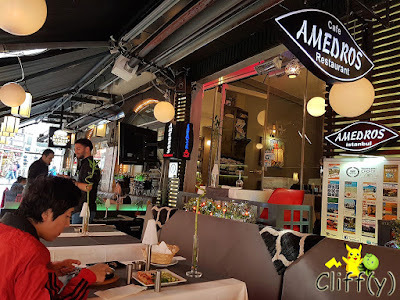 Online search brought me to Amedros Café, a highly rated eatery with impeccable service that has been around since 1995. From the start to the end of the meal, the two staff members were really friendly to not only my BFF and me, but also other guests. 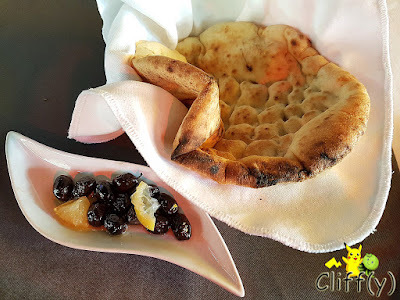 The lunch began with a piece of warm flatbread that whetted our appetite. The preserved olives were made merrier with lemon slices. 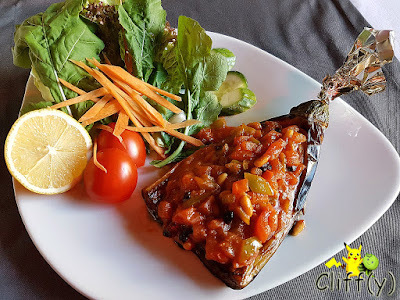 We had a pleasing vegetarian appetiser of fried eggplant, which history dates back to the days of the Ottoman Empire. 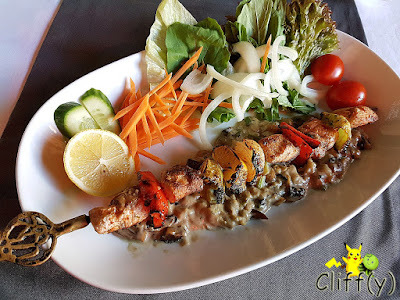 The dish that made use of a generous amount of olive oil was stuffed with an assortment of ingredients, such as currants, tomatoes, green peppers and pine nuts. 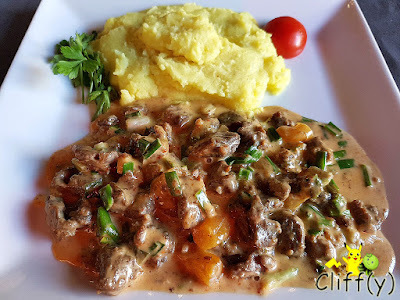 I was praying hard that the dish of lamb cooked with cream sauce would be excellent, but the eatery's version turned out to be less sterling. While it was adequately rich, I felt that some of the lamb pieces could be juicier. On top of that, the dried apricots weren't that sweet. The accompanying mashed potatoes were milky enough. I can count with fingers of one hand the number of times I've eaten swordfish. The chunks of white meat were tasty enough, but not as succulent as expected. They were skewered and grilled with bell peppers and onions. I'm not too sure about the mashed stuff, but it was pretty creamy without being cloying. 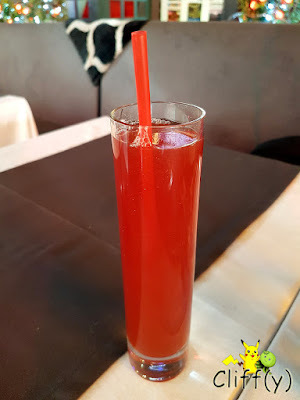 It was a tad disappointing to see that the drink appeared simply red instead of having a gradation of colours as the name might've suggested. Also, it was surprising to see it under the list of non-alcoholic cocktails when it clearly states Blue Curaçao as a component in the drink, along with apricot juice, pineapple juice and pomegranate syrup. The concoction was mildly refreshing and not too sweet. The eatery doesn't serve dessert. 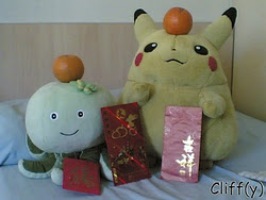 Pika's advice: Try not to decline the offer of tea on the house at the end of the meal. Unfortunately, we had to do so as we were rushing to meet my sister. 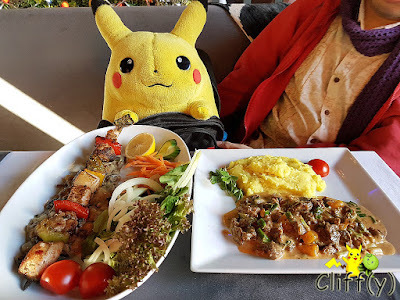 *Prices quoted are subject to ₺10.00 (~S$3.25) service charge.